Please refer to our stock # 2891/5431 when inquiring. 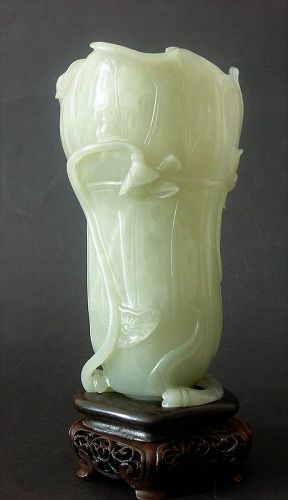 A Chinese jade vase, carved as a lotus leaf with a flower in one corner and a ribbon tying the leaf and its coiled trailing stalk forming the base. The composition is very attractive, the body is quite thinly carved and the stone is of celadon hue. A high quality example of Qing lapidary arts, it measures 14 cm ( 5 1/2 inches) high. It comes with its own custom made wooden base. Age; 19 C. condition: excellent.